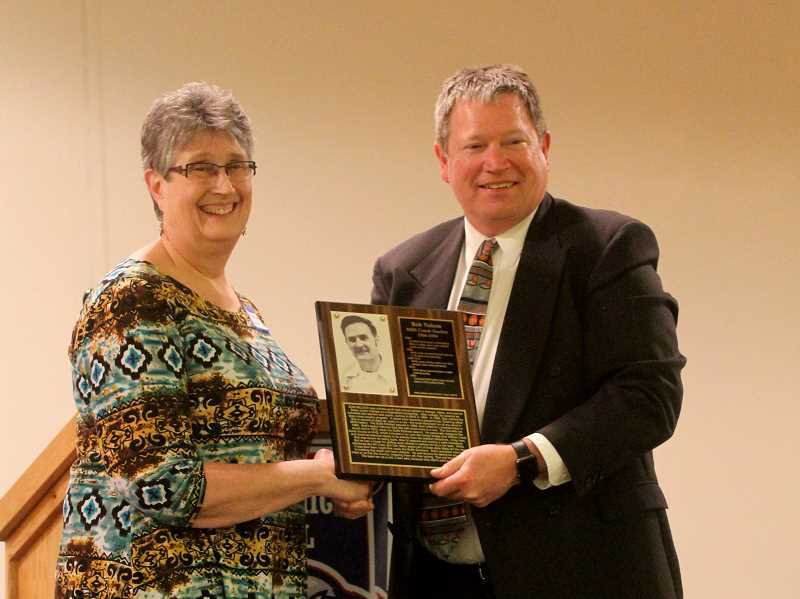 Six Madras High School athletes and one team inducted into the 2019 Hall of Fame. 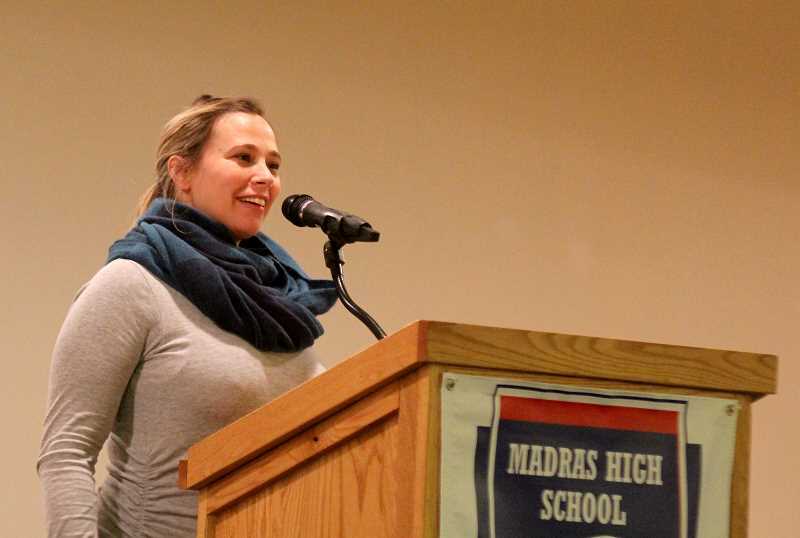 Six athletes and one team were inducted into the Madras High School Athletic Hall of Fame Friday. The largest crowd for the induction ceremony in the program's three years were on hand to hear moving speeches from athletes ranging from a 1954 graduate (Charles Nathan) to a 2003 graduate (Tosha Wilson Mendenhall). The induction of the 1960-61 boys basketball team —which won the school's first ever team title in any sport — was a highlight of the evening. Ten men on the team came to the event. What's more, several of the team's cheerleaders were on hand, in their blue sweaters of the period. Keller Christensen (class of 2000), Joe Piedmont (1961), Spud Smith (1986), joined the '61 state championship team, Nathan and Mendenhall in being inducted. 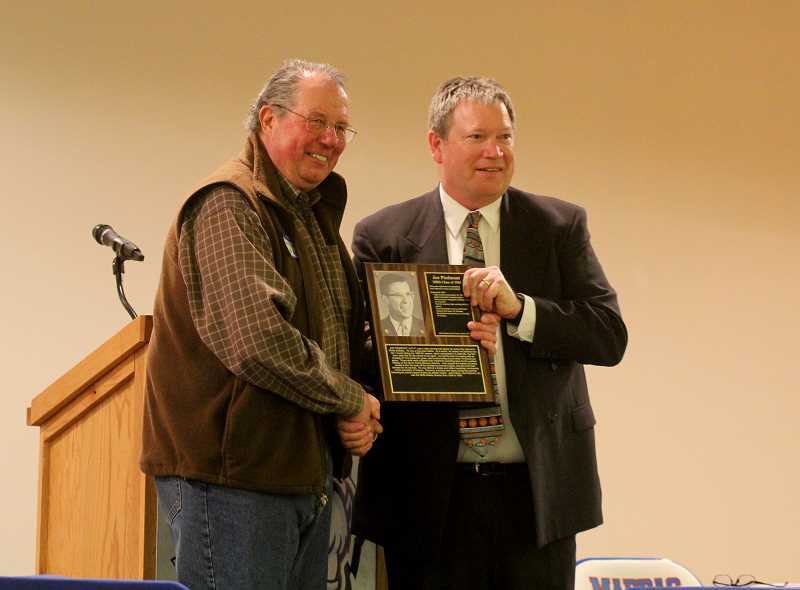 Bob Nelson, the coach who established the Buffs' cross country program in 1966, and won four straight state titles, from 1969 through 1972, was also inducted. The event included a dinner and welcoming/introduction of the hall of fame class. Later, they were also honored at halftime of the boys basketball game against Molalla. The hall group gathered at the baseline and were individually introduced and walked to half court, each receiving big ovations from the crowd. After the game, the formal inductions took place to a packed house in the commons. Along with the halftime introductions, the acceptance speeches, just as they have been in the first two hall classes, were a highlight of the evening. Piedmont, who was also a member of the '61 team, was introduced by master of ceremonies Tom Norton as leading that team in scoring and rebounding. During his speech, Piedmont joked that "It was a little known fact" that he also had kept stats during the season. Piedmont put forth a common theme of the speeches: how great it was to grow up in the small town of Madras, and how much support the community provided them as young athletes. 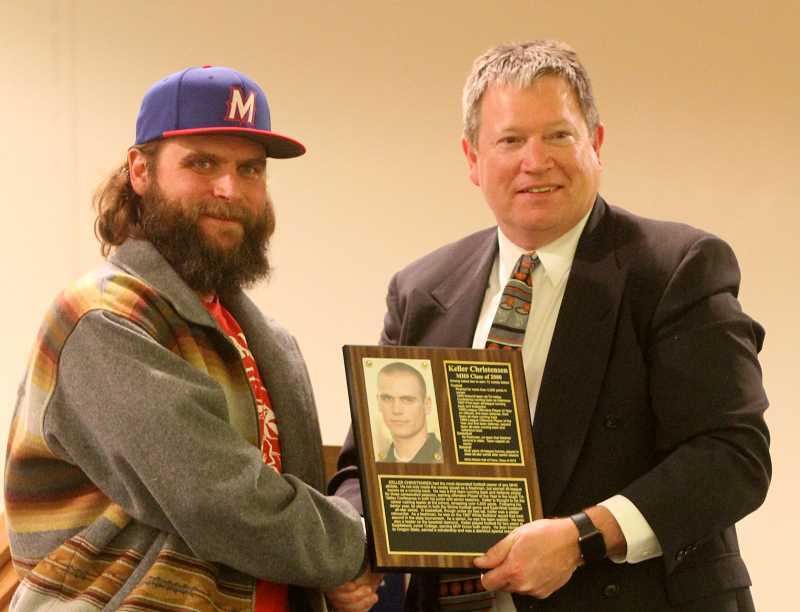 Smith, a standout baseball player and among the school's best-ever football players and wrestlers, and Mendenhall, an all-state basketball and soccer star who led the Buffs to the 2003 state basketball title, both thanked their families. Mendenhall noted her father "followed her around all over the state, from Henley, to Ontario ..." Both also expressed their appreciation for being part of that specific hall class, and sharing the stage Friday with them. Nathan was a stud athlete at in the early '50s, and over age 80, still looks like a solid block of granite. 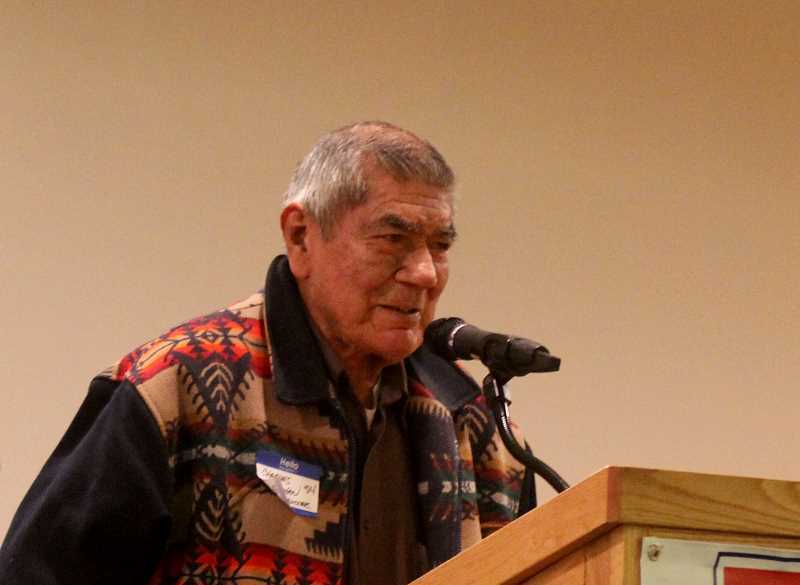 He was a forward on the Buffs' 1954 district basketball champions that became the darlings of the state sports circles by winning two games at the big school basketball tournament, including a quarterfinal victory over Benson Tech of Portland. Nathan was also a four-year football letterman and would play both basketball and football at Willamette University. As all the honorees did, Nathan noted his appreciation for the hall committee, and recalled his teammates, adding if not for the broken ankle Roger Diddock suffered late in the win against Benson, the team may have won more games in the tournament. Gregg Macy, a member of last year's hall of fame class, spoke for the 1960-61 basketball team, and introduced those on hand. He recalled the lighter memories that stayed with them, "Getting a free milkshake at the Dairy Queen after wins." He also praised their coach, Ole Johnson (an inaugural class hall of fame inductee, in 2017). It was the "Ole style of basketball" that made Madras successful in the sport, noted Macy. Playing in the 2A division, Madras crushed all its opponents, its closest game in the division being 16 points heading into the tournament. So Johnson set up a late-season game against a strong 1A Bend, in Bend. The Buffs were handed their only loss. "Ole wanted us to lose. It was just what we needed," said Macy. The squad wouldn't lose again and would claim the school's first state championship. Johnson moved on to coach Wilson High School the following season. Norton noted that Johnson was not only a member of the inaugural hall class, but now had two of his teams and five players that he coached inducted. Johnson, now 91, still lives in Portland. He had planned to attend but could not make it. The late Bob Nelson was represented at halftime by his daughters, Mary Souers, Lisa Abell and Debbie Gable. Gable represented the family during the speech. She noted how winning the championships (four titles in a row book-ended by two runner-up efforts) was a source of pride for her father, but what moved him the most was being able to help his young athletes reach their potential. She also recounted how the coach would dispatch his daughters to different parts of the course, to yell information to his runners, to tell them how many competitors they needed to pass. No coach in MHS history has had a stronger, longer run of success in any sport than Coach Nelson had with the boys cross country program in the late '60s, early '70s. He also taught industrial arts at the school from 1964 through 1994. The final speech of the evening came from Christensen, who earned varsity letters in three sports from his freshman through senior years, was a two-time Tri-Valley Conference Player of the Year in football and would play for Oregon State. He started by saying he would "never be inducted into the public speaking hall of fame," then proceeded to close the night with a very funny, heartwarming address. 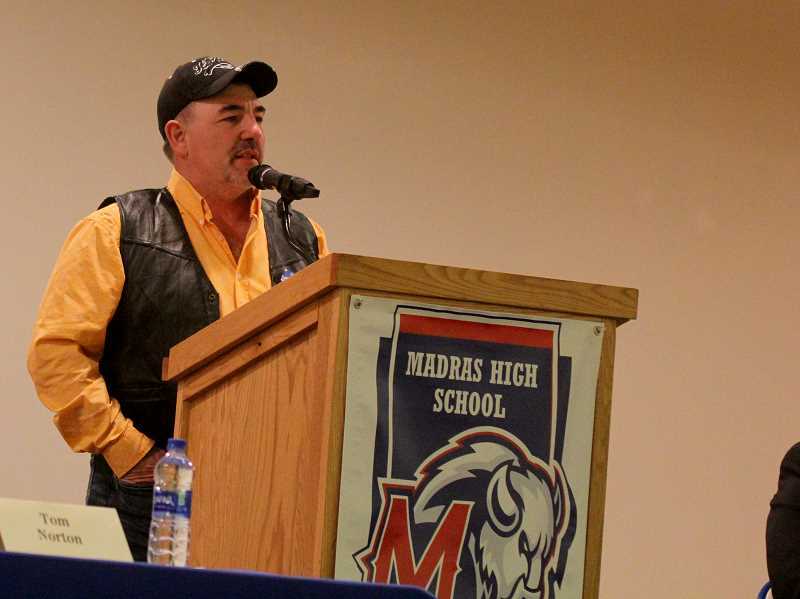 He kicked off his speech by praising the Madras High School community for its spirit, noting that the '61 basketball team "hadn't played in a game in 59 years, and their cheerleaders show up!" — a comment which drew the loudest cheers of the night. As other inductees did, he praised his parents, who lived far from town but still made sure Keller and their three other children, all busy with athletics and other activities, didn't miss opportunities and practices. Christensen's father passed away when Keller was in high school. Christensen recalled his father's influence and showcased his tenacity for sports by telling how his dad, upset over the refereeing in a high school district wrestling match, afterward went to the mat to let the official know that he'd cheated a kid out of going to state. He'd be ushered from the gym for doing so. "The funny thing was, neither of the kids were from Madras," said Christensen. He thanked coaches John Scheideman and Evan Brown, who were both on hand. He also jokingly apologized to his mom for not becoming a rodeo star or musician." Christensen said his mother had told him it took a community to raise him and he ended by saying, "Tonight, I'd like to formally thank that community." The hall of fame induction speeches were recorded and posted to Youtube. For a link to the video, go to the Madras Boys Basketball Facebook page. The MHS Athletic Hall of Fame is not funded by the school, but is funded via donations. Bright Wood Corp. donated four courtside seats to a Blazer game and drawing entries were sold for over a month at basketball home games. The drawing raised $2,042. Ben Anderson was the lucky entrant. To contribute to the hall, send a check to the MHS Athletic Hall of Fame, 390 NE 10th St., Madras, OR 97741.